We focus on kitchens in this continuation of our series on long-term hotels. For extended stays, we recommend having a kitchen in your hotel room. However, many people often do not think about the difference between a kitchenette and a “full kitchen” – at least in hotel terms. Most extended stay hotels offer a “full kitchen” and come equipped with essentials such as pots and pans, dishes, glasses, utensils, etc. The basic appliances that typically come in a full hotel kitchen are a sink, full-sized refrigerator, stovetop, and dishwasher. Other hotels will offer a kitchenette, which provides a separate area with a mini-fridge, microwave, and usually an extra sink and some counter space. Note: The majority of hotels with “full kitchens” will offer a stove top, and some offer full ovens. While your home is undergoing construction, you will likely be spending a good amount of time meeting with contractors. Consequently, you may be pressed for time and be open to some simple solutions to speeding up mealtimes. With this in mind, we suggest planning a few meals that can be cooked on the stove or require no appliances at all. We recommend buying food that does not need to be cooked and does not spoil easily. Note, often hotels will offer a complimentary breakfast. However, if your hotel does not serve breakfast, you could buy a box of cereal for everyone to share and a couple packs of milk cartons that don’t need refrigeration. Peanut butter and honey sandwiches are a great staple for lunch. Snack packs, crackers, and nuts or seeds can help provide a variety of food at a low cost. Long-lasting fruit like bananas and apples are also easy to eat throughout the day or take out of the hotel. If you do need dishware, we recommend you skip the disposable kind and buy a set of sturdy plastic utensils for each family member. Invest in some food storage containers and use them in place of plates and bowls. This way, trash can be eliminated from your room, and leftovers can easily get stored in a fridge or simply sealed for later use. This habit can help keep clean-up quick and easy. If you require something specific, and before purchasing on your own, we suggest asking your ALE Hotel Solutions Coordinator for a complete list of what will be included in your hotel prior to checking in. If there is something you do need to purchase, be sure to save your receipts. 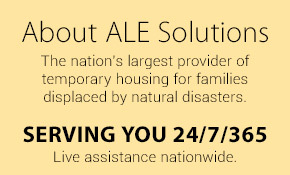 For more information about post-disaster recovery and temporary housing solutions, please contact ALE Solutions. Stay tuned for more hotel tips here on Discover ALE!